Packed up my office at BCcampus, took down the artwork, threw away the small amount of paper archives I had, loaded up the pickup truck, and closed the office door behind me. Thus ends almost 9 years at BCampus – the longest I’ve worked anywhere. Judging by whats in the truck it’s amazing how small a footprint I’ve had. A rug, an odd ToDo chair that has been my place of work (instead of a desk), and a lamp that I like beside me – especially in the dark rainy days of winter. On the other hand I’ve been sent e-mails by many people across BC’s post-secondary system expressing thanks and saying I’ve been an inspiration. Oh my, maybe that footprint is bigger than I think. To be honest I’ve been surprised by what many people have said in their e-mails to me. I had no idea they felt that way or thought those things – in some respects I wish I’d known! BCcampus has been an amazing learning experience for me and I’m grateful to my senior management team colleagues, the entire BCcampus staff, the Ministry of Advanced Education, and the broader network of connections I’ve made across higher education. I feel privileged to have had the opportunity to help create BCcampus and believe it has become a world class innovation that is both an inspiration and an accomplished provider. My career has followed an adult learning and educational technology trajectory, for which there has been no career path. All of us in educational technology are inventing our own careers and so I’m particularly delighted with this most recent turn as my career path leads me to Creative Commons. I’m taking everything I’ve been doing at BCcampus and moving it up onto an international level where I hope to have more impact. I look forward to engaging with others who are adopting open willingly, strategically, and with some excitement. I’ve written extensively in this blog about my own personal experiences with Open Educational Resources and with the open movement more broadly. I’ve come to see “open” as a fundamental change not only for education but for society and the world at large. I can imagine a world where the sharing efforts of all raise the bar on standards of living and create a new global economic future based not so much on growth but on better global use of collective works. This blog has been quiet over the last few months as I’ve been dealing with the practicalities of wrapping up BCcampus work and making arrangements for my new role at Creative Commons*. 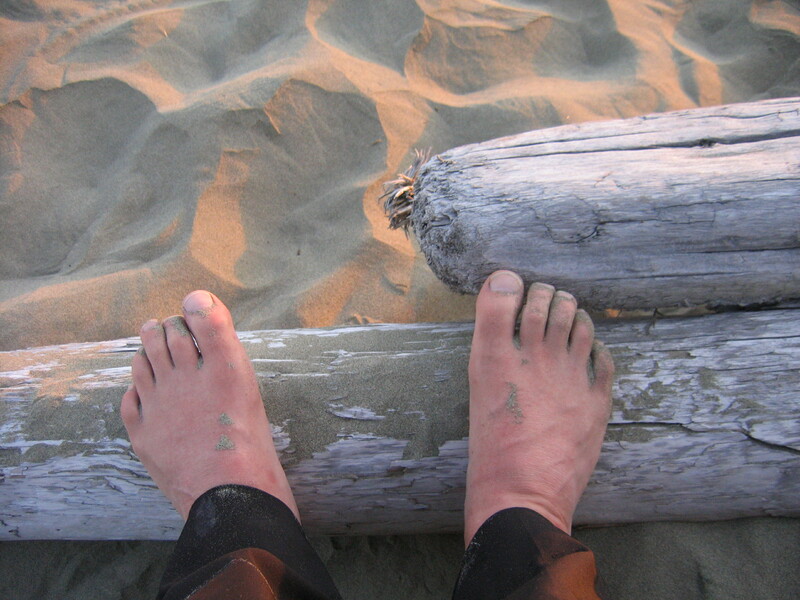 I’ve also been fortunate enough to have some off grid time at Pacific Rim National Park near Tofino on the west coast of Vancouver Island where life was barefoot in nature, walking the beach, and riding boogie boards in the big surf. Time immersed in nature with no phone, no e-mail, no computer, no TV is wonderfully liberating and I came back rejuvenated and raring to go. Most countries have copyright collectives – organizations which collect royalties or payments from licenses, performances, and even blank media, for the ostensible purpose of distributing it to copyright holders, creators, or engaging in activities which benefit copyright holders or creators. In Canada we have Access Copyright. Back in June 2010 Access Copyright proposed new interim tariffs that would raise the fee they collect from post secondary institutions across Canada from about $5/student to $35/45 per student. Amazingly this was proposed without business case financial justification and without any disclosure of the catalog of works in both print and digital form that they represent. In addition Access Copyright expanded definitions of what a copy is in highly contentious ways and mapped out extensive reporting and access requirement expectations. Access Copyright’s proposed interim tariffs, new copyright definitions and reporting requirements were met with widespread objections from CAUT, ACCC, AUCC, CLA, Canadian Alliance of Students, and others. I wrote about this development in Jan 2011 Access Copyright’s Royalty Demands Spark Interest in OER. 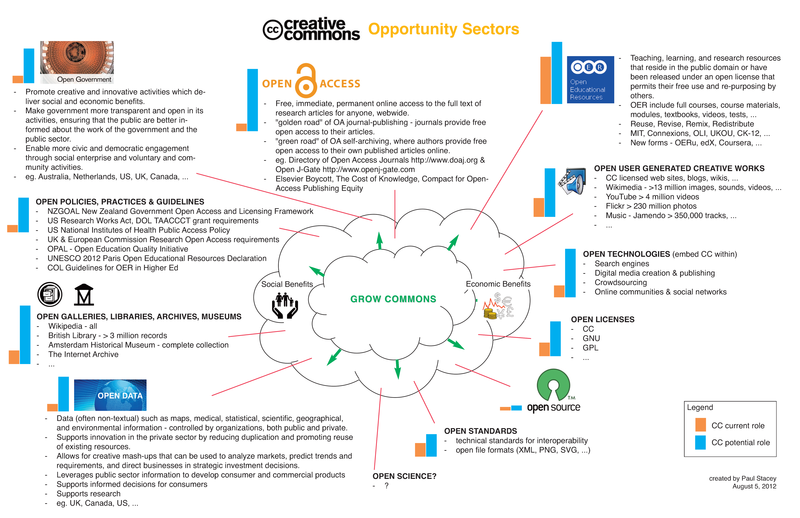 By May 2012 at least 34 Canadian colleges and universities had opted out of Access Copyright. In January 2012 the University of Toronto and the University of Western struck special deals with Access Copyright agreeing to an interim tariff rate of $27.50. This was met with considerable dismay Critics say universities paying to hyperlink is ludicrous such that the UofT Faculty Association Questions the Access Copyright Agreement. In April 2012 the Association of Universities and Colleges of Canada (AUCC) reached an agreement with Access Copyright agreeing to interim tariff rate of $26. Amazingly this deal was struck secretly, behind closed doors, without communication with AUCC’s own members. At the end of May 2012 Access Copyright Announces Agreement With the Association of Community Colleges of Canada on a Model Licence for $10 per student. OK, let me see if I have this right, Access Copyright starts out saying the fee per student will be $35-45. They then negotiate agreements with various organizations for rates of $27.50, $26, and $10. The variation in rates is puzzling. There was no business case explanation for the initial interim tariff fee and there has been no explanation for the reduced fees. On what basis are these rates being set? These agreements continue to be widely questioned – The Best Possible Outcome for Universities, Really?, Why Universities Should Not Sign the Access Copyright – AUCC Model Licence, A Bad Deal: AUCC/Access Copyright Model License Agreement with many calls for universities not to sign the agreement. Some universities, like the University of British Columbia had taken bolder more principled positions. While I (and many others) are critical of the way Access Copyright is handling its mandate I want to be perfectly clear that I personally believe writers, artists, musicians and other creators should be fairly compensated for their work. An artists life is frequently one of poverty (aside from the mega hit makers) which I think undervalues their cultural importance. However, I question whether collection agencies like Access Copyright are really serving the needs of creators – a view somewhat substantiated by Brian Brett Speaks Out: An Open Letter on Access Copyright and the Canadian Copyright Emergency. Third party middle men intermediaries seem more intent on funding their own activities over those of the creator. As William Patry notes in his book How to Fix Copyright “The largest problems facing authors today are not unauthorized uses but the obstacles put in the way of buyers willing to pay for access to or copies of the work. I hope this changes as new web-based business models emerge that allow creators to get paid directly. Expansion of fair dealing to education, satire and parody. (Am I the only one who finds it deliciously amusing to find education lumped with satire and parody? I”m sure Canadian comedy shows like This Hour Has 22 Minutes and the Rick Mercer Report are pleased at the inclusion of satire and parody). Fair dealing allows educators to use copyrighted works for private study, research, criticism, review, and news reporting. There is no explicit definition of what fair dealing means. Essentially you have to use the Supreme Courts six criteria for evaluating fair dealing – 1. the purpose of the dealing, 2. the character of the dealing, 3. the amount of the dealing, 4. alternatives to the dealing, 5. the nature of the work, and 6. the effect of the dealing on the work. While these six criteria are useful, the lack of a clear definition means that for most educators fair dealing is, and will continue to be, vague and ambiguous. Non-commercial user generated content. The new act distinguishes between commercial and non-commercial use. Non-commercial user generated content gives educators greater liberty to create instructional materials (within the parameters of fair dealing) as long as the use is non-commercial. Internet publicly available materials. This exception gives educators permission to reproduce and communicate works that are publicly available on the Internet. This will be a major relief for educators who are increasingly tapping in to digital web-based content. Under the new act this educational use of publicly available Internet materials is allowed as long as the audience is comprised primarily of students and the works in question are 1. legitimately posted by the copyright holder, 2. not accompanied by a statement prohibiting such reproduction, and 3. not protected by digital locks. This provision makes Access Copyright’s assertion that even a hyperlink is a copy for which users must seek permission seem bizarre. Public performances in schools. The new act allows instructors to display films and other media works in class, provided that the works have been acquired legitimately. This amendment lifts restrictions that required educators to acquire rights for public performance before they could show such materials. Coupled with the Internet publicly available material exception educators will now be free to include videos and other materials from sites like YouTube in their instructional materials. Technology neutral display exception in schools. The old act limited allowable technology reproduction to an overhead projector. The new act is more technologically neutral allowing for display via video projectors and other technological devices. Online transmission of lessons. The new act allows educators to create “fixations” (weird terminology given that a fixation often refers to someone with an obsessive attachment) of lessons and transmit these fixations to students over the Internet. In addition to weird language this exception has some strange requirements that are not particularly in line with pedagogical practice. The institution must destroy the fixation within 30 days after students have received their final course evaluations. And students are to be prevented from reproducing more than a single copy of the lesson for personal use which they too must destroy by the 30-day deadline. For additional information BCLA has provided a Bill C-11 Guide for Academic Instructors that outlines how the new bill affects education. Michael Geist provides a good summary of the overall outcome including a side-by-side table comparing the old act to the new act The Battle over C-11 Concludes: How Thousands of Canadians Changed The Copyright Debate. While these changes give educators more permissions and clarity on what is allowed and not allowed I still think the best way to avoid the copyright minefield is to use Creative Commons openly licensed materials whereby the copyright holder explicitly gives permission. Using Creative Commons licensed resources removes the fear of litigation that shrouds copyright. In July 2012, amidst the tumult of copyright deals and reform, the Canadian Supreme Court made rulings on five copyright cases. These rulings were made using the old copyright act not the new one which has yet to come fully in effect. Reading these rulings was a breath of fresh air – clear lucid thinking well argued. teachers share a symbiotic purpose with students/users who are engaged in research or private study. Photocopies made by a teacher and provided to students are an essential element in the research and private study undertaken by those students. “Private study” does not mean in solitude or geographically separate from the school. Students in a classroom can be engaged in private study. Research can be piecemeal, informal, exploratory, or confirmatory. It can in fact be undertaken for no purpose except personal interest. Howard Knopf seems equally proud of the Supreme Courts rulings and provides a comprehensive summary at A Proud and Progressive Pentalogy Day in Canadian Copyright Law. These Supreme Court rulings affect Access Copyright and the negotiated deals it has struck with various organizations. Clearly those deals are far more restrictive than necessary and in some cases have institutions paying fees for activities they are fully allowed to do under law. Michael Geist provides an interesting take in Why the Supreme Court’s Copyright Decisions Eviscerate Access Copyright’s Business Model. Who knew that copyright had such high drama! Great potential for a TV series. Expect I’m not the only one who has learned a lot from these people. While I admire and appreciate the analysis the above people are providing I’ve been surprised by the lack of coverage of open licensing using Creative Commons licenses as a means of cutting through the complex and often vague rights and permissions of copyright. If educators want to completely free themselves from being encumbered by copyright complications they should use and produce Creative Commons licensed resources instead. Doing so simplifies matters enormously. As more and more organizations develop copyright guidelines and tools for faculty and staff to use (such as this one at the University of British Columbia http://copyright.ubc.ca) I look forward to side-by-side workflow diagrams that compare the process you must go through to ensure you are allowed to use something under copyright vs the work flow process you must go through to ensure you are allowed to use something that is openly licensed via Creative Commons. The copyright workflow will inevitably be comprised of innumerable steps with many if/then branches leading to stop signs or legal counsel interpretations of possible risk. The Creative Commons license workflow will be one step or, in the case of non-commercial and share-alike versions, two or three steps, after which it’s clear sailing with no legal counsel intervention and no risk. 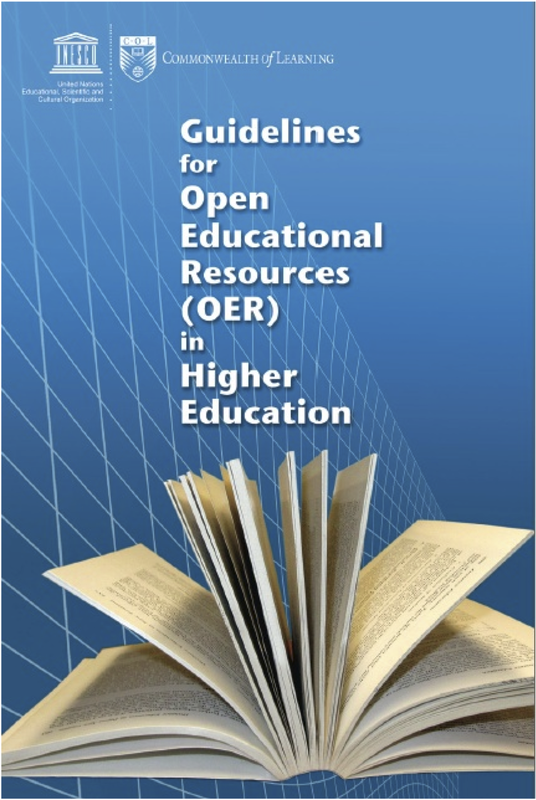 UNESCO member States unanimously approved the Paris OER Declaration (pdf). Having received unanimous approval it will now be interesting to see how governments, institutions and other organizations adopt policies and practices in support of these goals. This is a whole new business model for education – one that brings with it social and economic benefits. That’s a lot of open. The opportunity is large. Use and impact has only just begun. I’m looking forward to doing my part to grow the commons and by so doing generate global social and economic benefits.